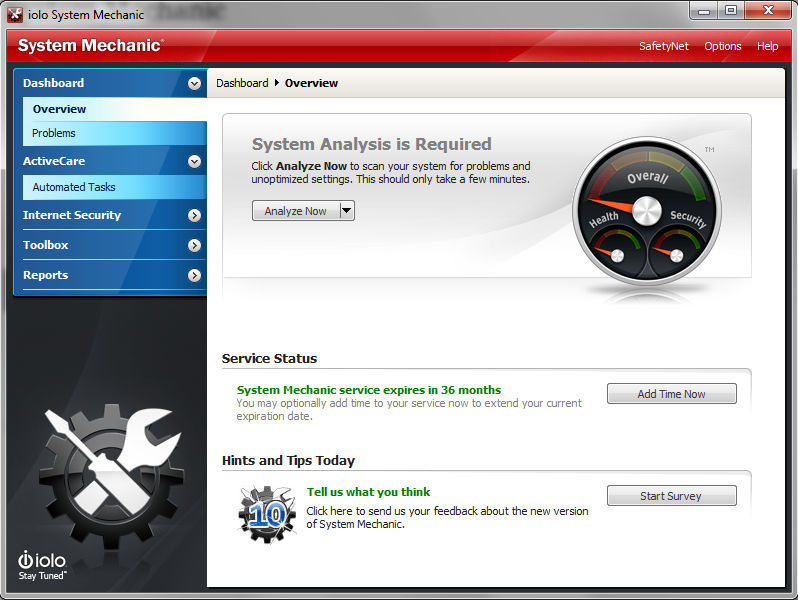 System Mechanic (normally $49.95) can be had, today only, for FREE, over at Softpedia. A big “Thank You” to regular reader Charlie L., for one more super heads up. 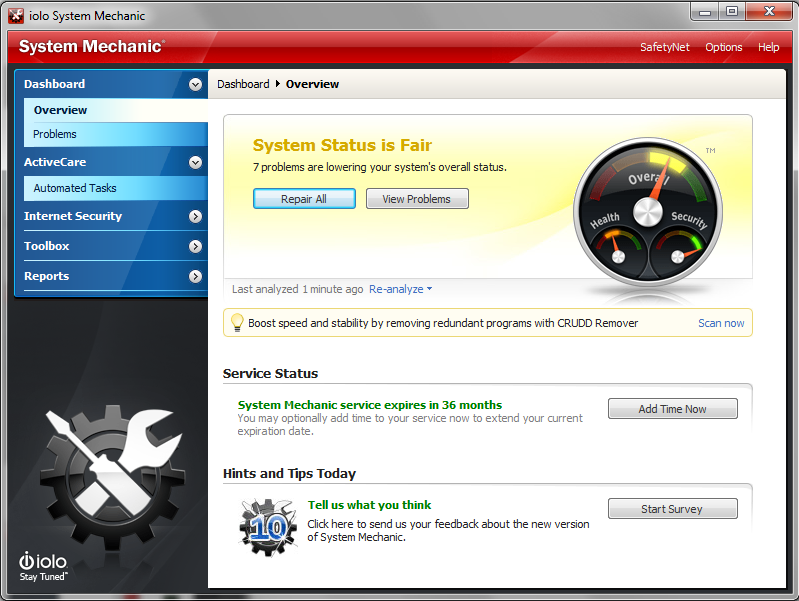 System Mechanic is a highly effective performance-tuning application designed for the average user. System Mechanic is the most inclusive system application I have ever tested. And, the developers have managed to do this in such a way, that an average user does not have to drill down through complex menu structures to correct performance issues that negatively impact his computing experience. 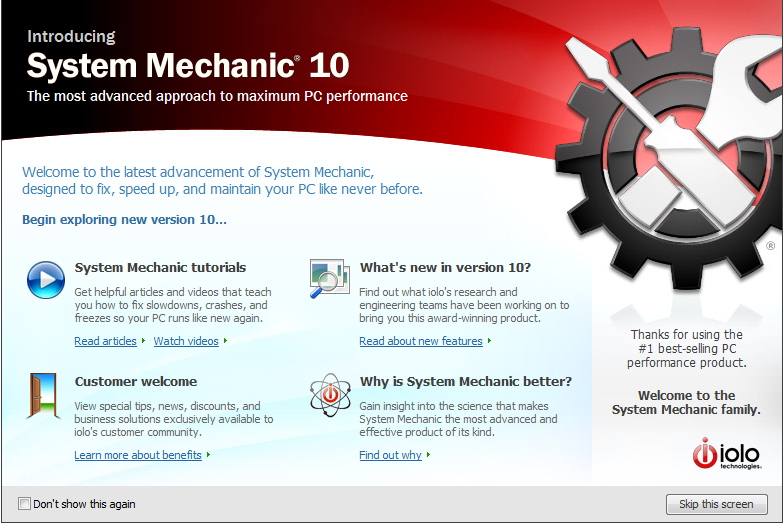 You can read a full, hands on review of System Mechanic 10, originally posted here October 29, 2010. 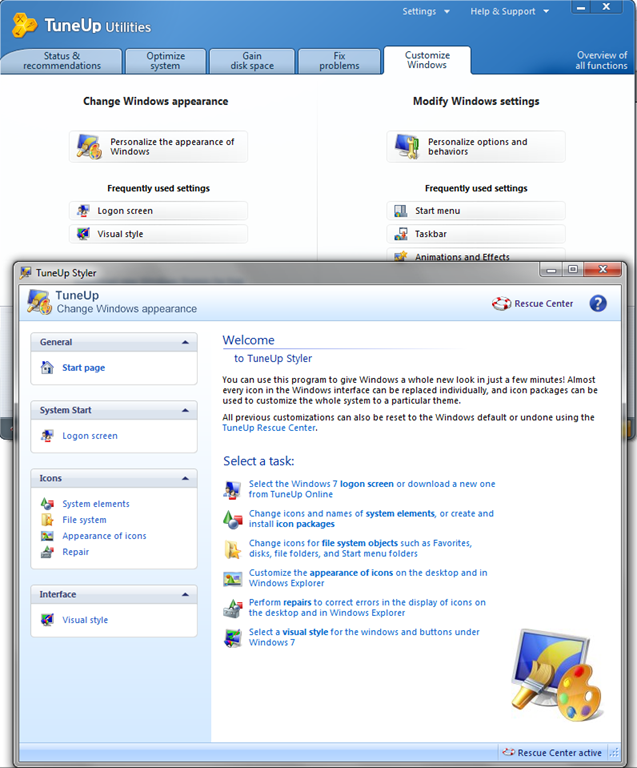 It’s difficult to be in IT and avoid being asked for advice on computers – everything from operating systems – (should I be running Windows 7? ); malware – (is the Internet really unsafe? 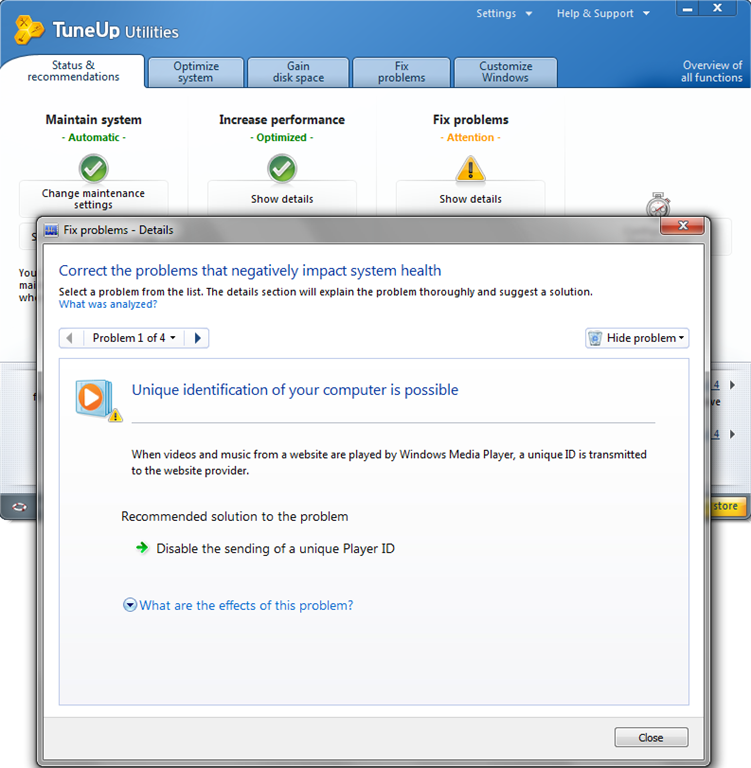 ); problems – (what’s wrong with my computer? It’s always…..); and my favorite question – why is my computer so slow? Usually, the “why is my computer so slow?” question, comes up because the user is fed up with slow, and unreliable performance. Surprisingly, the answer to this common question is pretty simple, and in most cases the problems are easy to correct. As most experienced users know, PCs don’t slow down without a reason. 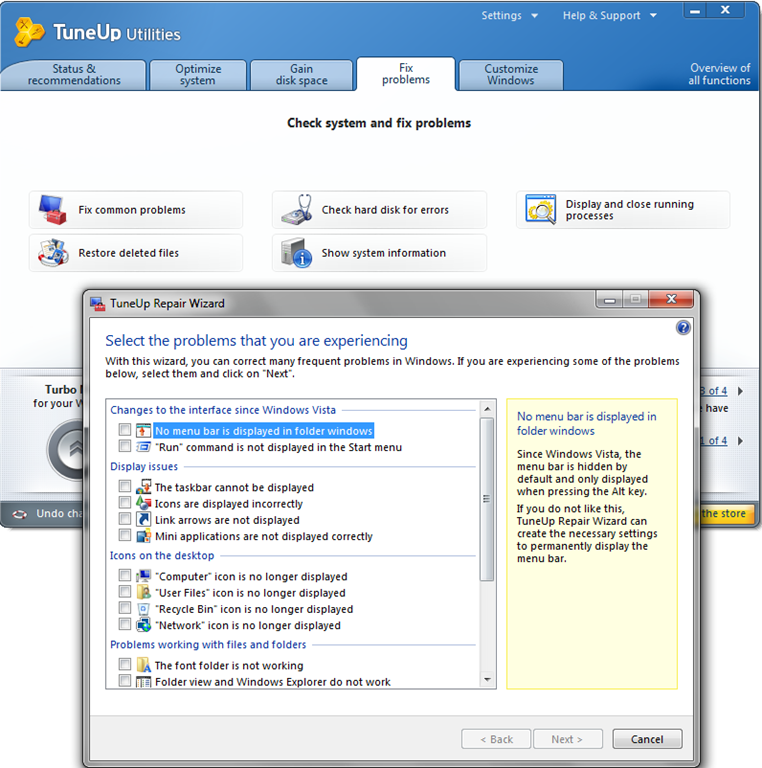 All computers have characteristic operating patterns that lead to predictable, but preventable issues. 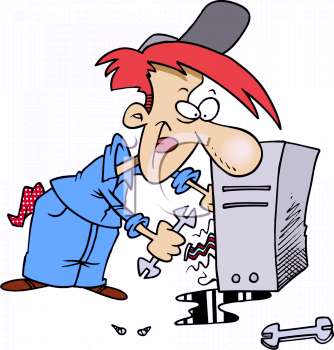 Simple maintenance, practiced regularly, which is easy even for a non-expert, if he’s using the right tools, will keep a PC running smoothly for years. 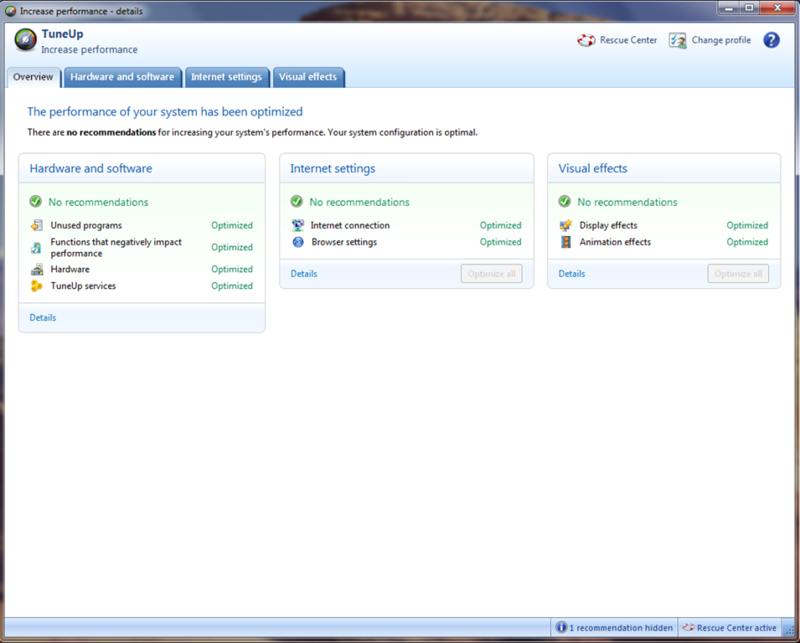 Regular readers here are use to reading reviews on free, quality applications, that help users identify the most common problems that have impact on a computer’s speed and behavior, and then match the problems with the appropriate free software solution. That works very well for the kind of readers that this site attracts – generally high end power users, or users who are intend on learning. But, for an average computer user, putting together a toolbox of free system applications may not be a complete and effective solution. 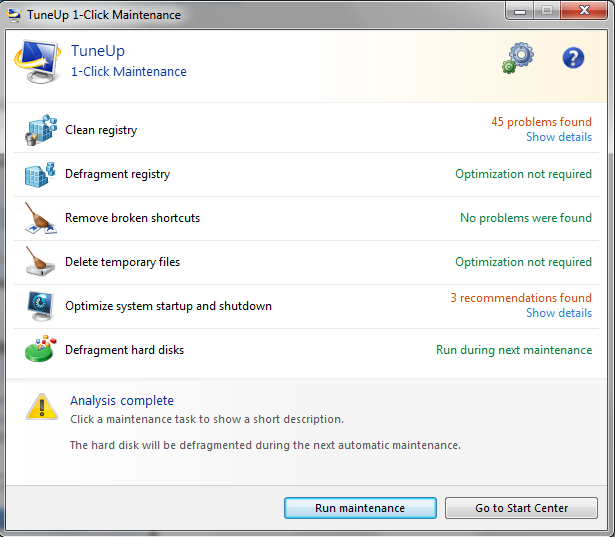 And that brings me to System Mechanic – a highly effective performance-tuning application designed for the average user. 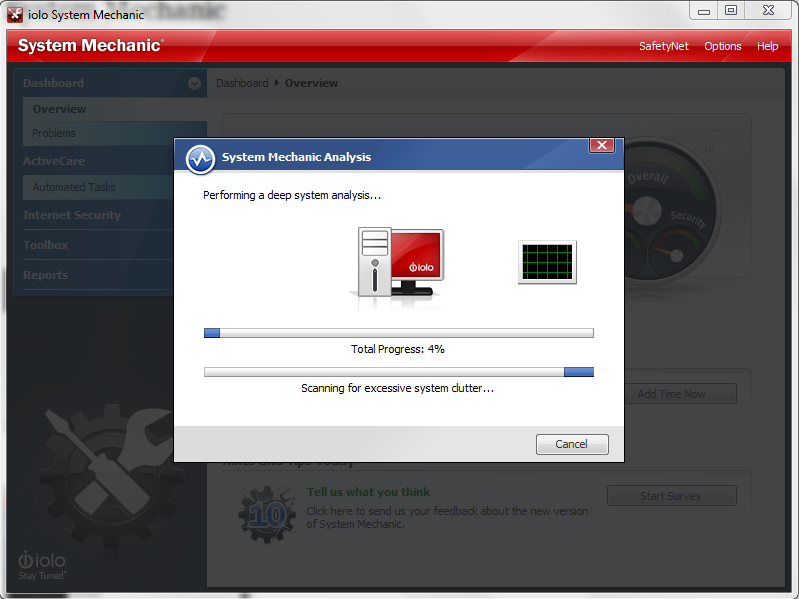 System Mechanic is the most inclusive system application I have ever tested. And, the developers have managed to do this in such a way, that an average user does not have to drill down through complex menu structures to correct performance issues that negatively impact his computing experience. 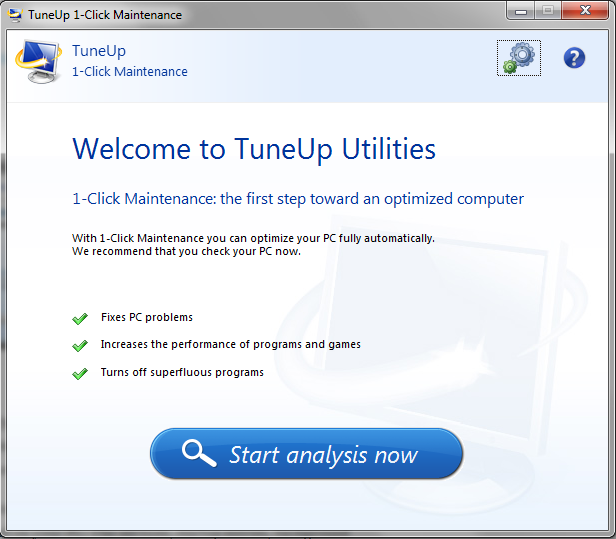 System Mechanic can uncover literally hundreds of issues that can impact a computer’s performance and reliability, and then correct identified problems – often, with just a few clicks of the mouse. 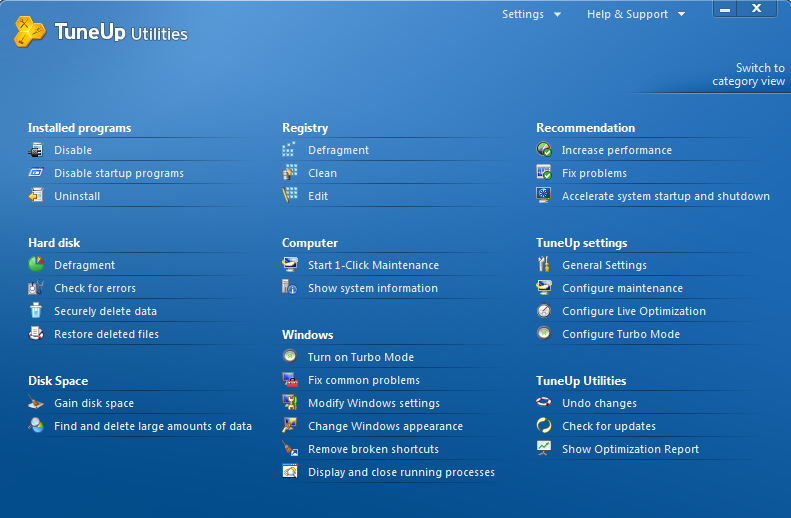 Installation is simple, following which you will have the opportunity to run System Mechanic for the first time. On launch you will be presented with the following screen. You’ll notice that you won’t be left on your own to figure things out – System Mechanic has some great tutorials, including videos, to get you started. (All screen shots are taken from my test machine – clicking on any graphic will expand it to its original size). First up is a System Analysis – available in two flavors: Quick Analysis, or Deep Analysis. In this test, the Quick Analysis took under a minute on my Windows 7 machine, and the Deep Analysis took less than 4 minutes on the same machine. The application provides a breakdown of the issues that need to be addressed, and offers an automated solution. Having corrected the 7 issues affecting overall performance on the test platform I then kicked in to “Active Care” mode, so that the program could automatically deal with additional issues that would, over time, negatively impact performance. 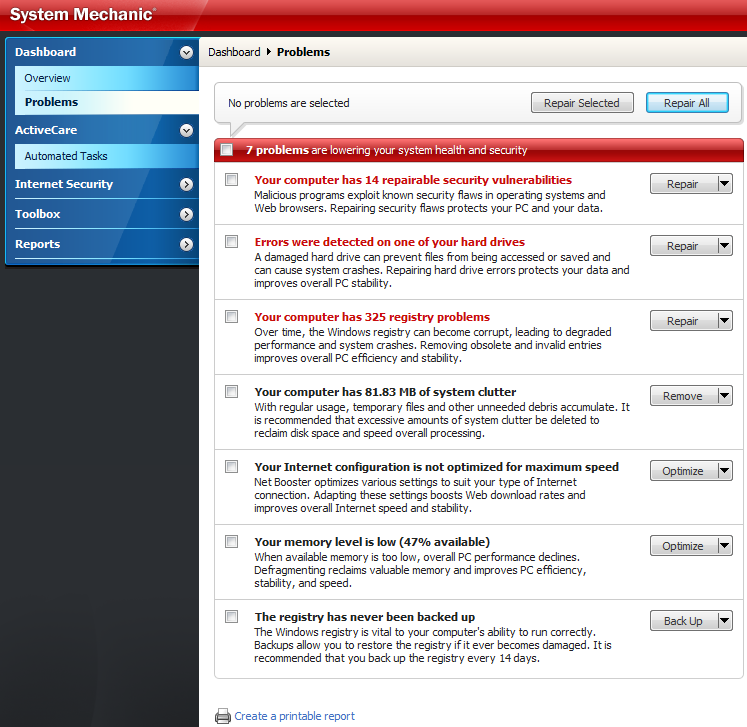 Tool, tools, and more tools; each one designed to address specific system issues, are a strong point of System Mechanic – as the following screen capture illustrates. 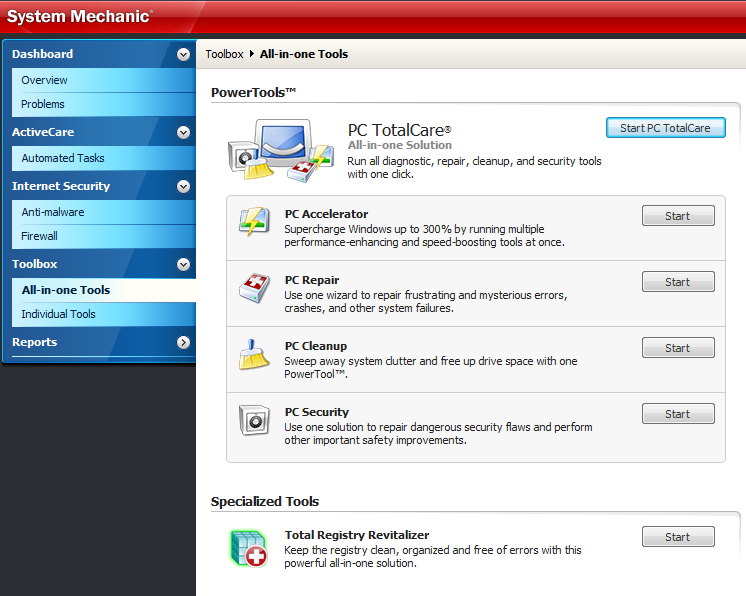 For power users, each tool is broken down into sub- categories, giving the user fine control over relative issues. Two weeks after installing System Mechanic on a test system that gets a very heavy duty workout on a daily basis, System Status remains “Good”. Given the grind that this machine is put through every day, this is a very impressive result. 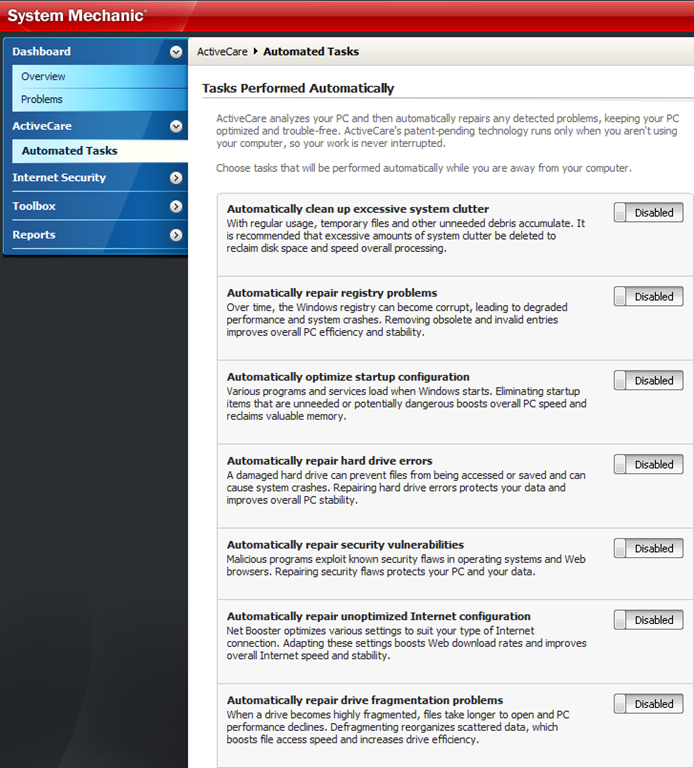 ActiveCare – automatically and effortlessly fixes and maintains your PC during idle time, keeping your system running like new. For additional specific information please go to Softpedia. System requirements: Windows 7/Vista/XP (64 or 32-bit). Download a trial version at: The developer’s site – (Iolo). Despite the fact that their is some disagreement as to the value of defragging modern Hard Drives, there is a slight leaning in the tech community toward defragmentation being a positive maintenance process. I support this point of view. Seven million downloads of Auslogics Disk Defrag from CNET, and an average user rating of 4.5 Stars speaks to the value of this small application, and to the popularity of defragging. 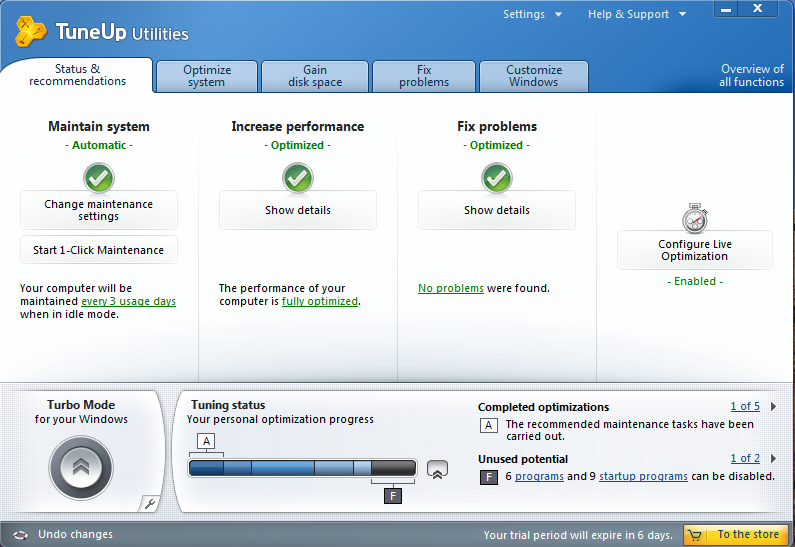 The application (last updated October, 2010), is extremely easy to use, does not require any analysis phase and is faster than most disk defragmentation software I’ve tested in the past, and best of all, it’s free. 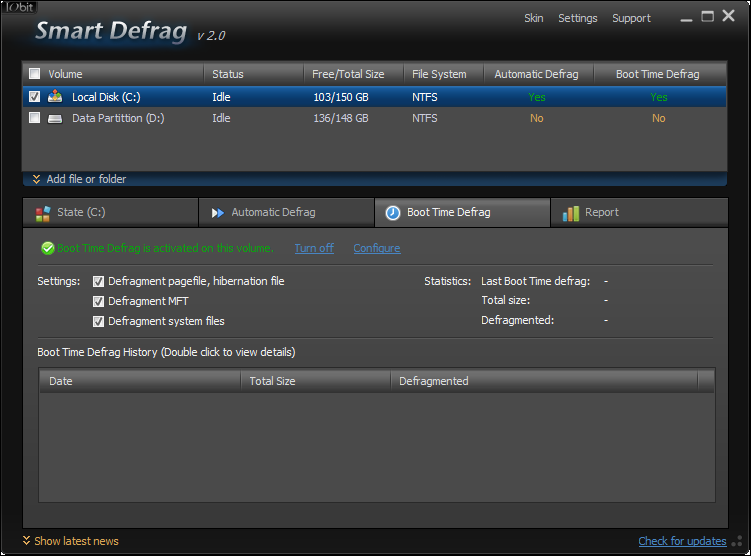 Auslogics Disk Defrag 3.1, can be run on a “set and forget” basis. I occasionally hear from users that they can’t remember the last time they defragged their disk/s – but they’ll get to it – eventually. But they don’t have to – Auslogics Disk Defrag 3.1, can do it for them on a continuous basis. The user interface is uncluttered and as simple to follow as any I’ve seen. 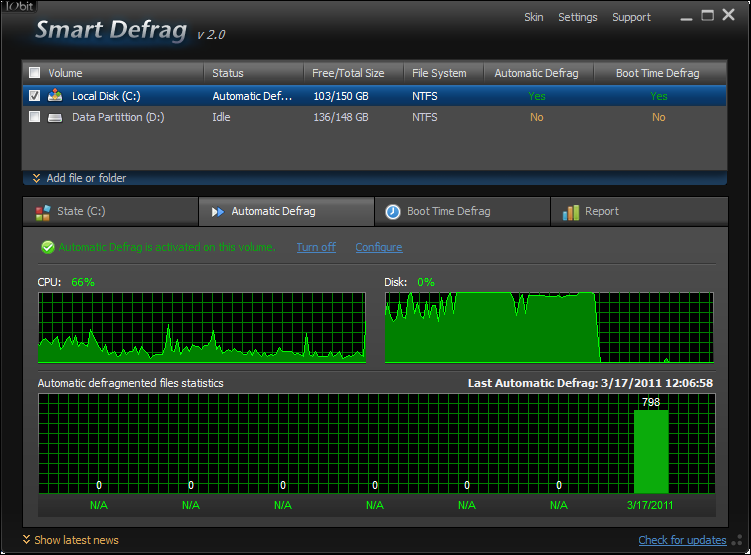 The following graphics illustrate just how easy it is to get Auslogics Disk Defrag 3.1 up and running. 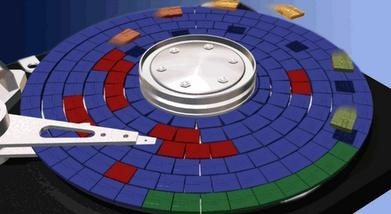 Disk Defrag will speed up your computer by moving system files to the fastest part of the disk. It will also move data files from the MFT Reserved Zone to prevent MFT fragmentation. 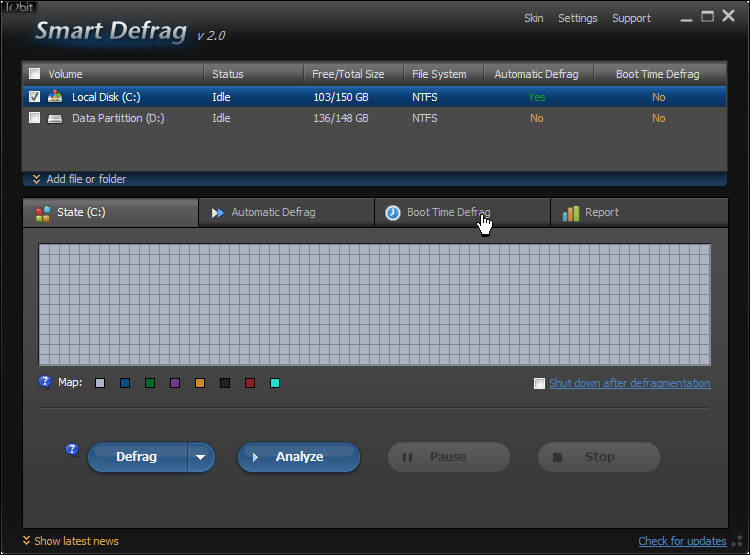 In addition to defragmenting your files, Disk Defrag can defragment free disk space. The free space is merged into a large contiguous block, which is an effective way of preventing file fragmentation. This feature ensures that file fragmentation is eliminated as soon as it occurs. You can set Disk Defrag to run automatically when your system goes idle. The program will analyze the disks and defragment them in the background if required. Defragmentation yields better results when it is performed on a regular basis. Disk Defrag is supplied with a flexible scheduler that will help you to schedule defragmentation according to your needs. 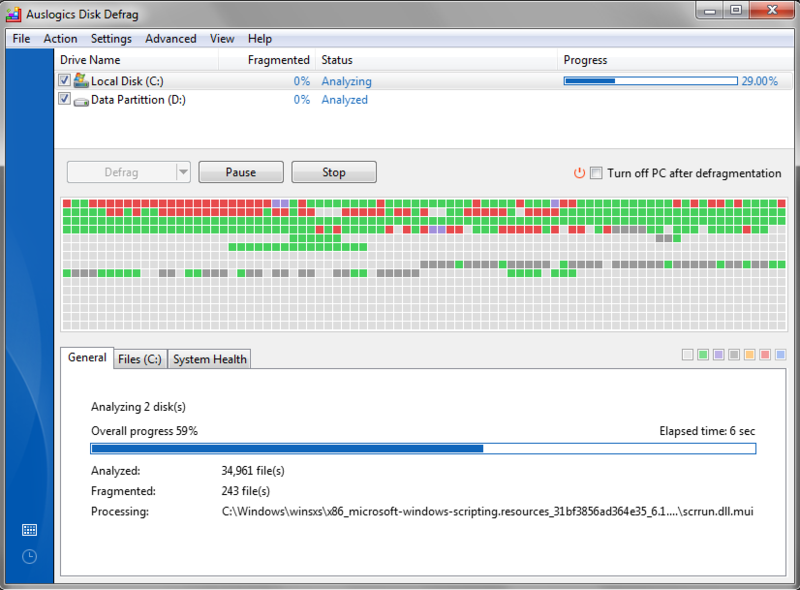 Have no time for defragmenting the entire hard drive? With Disk Defrag you can defragment a single file, several files or a folder. Disk Defrag is supplied with a powerful engine that can easily defragment large multi-terabyte volumes. It can also defragment several drives at once, which makes the defragmentation process a lot faster. 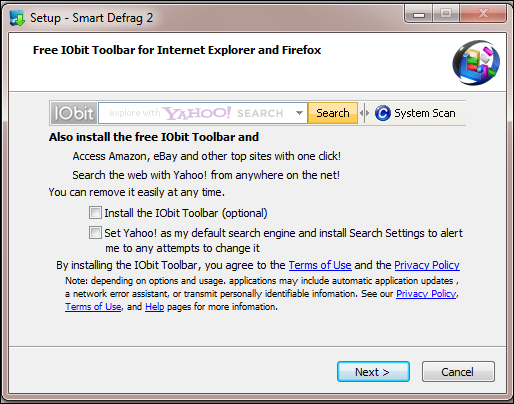 Before you begin the defrag process, I suggest that you run a program such as CCleaner, which will empty your Recycle Bin, Temporary Internet Files folder, and other locations where clutter tends to accumulate on your PC. As well, you should consider uninstalling any applications you no longer use. 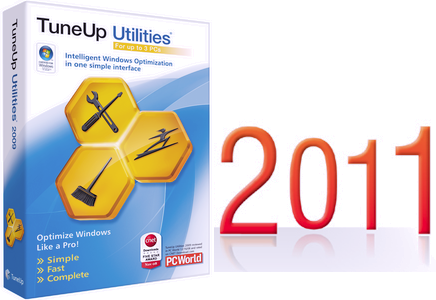 Revo Uninstaller is a free utility that will uninstall unneeded applications more thoroughly than the Windows native uninstaller. These steps are not absolutely necessary but, they are a good practice. System requirements: Windows 7, Vista/XP/2000/2003, 32-bit and 64-bit and dual-core CPU supported. For additional specific information please click on links to the developer’s site. Such as PC Accelerator™ that supercharges your PC up to 300% by running multiple performance-enhancing and speed boosting tools at once. 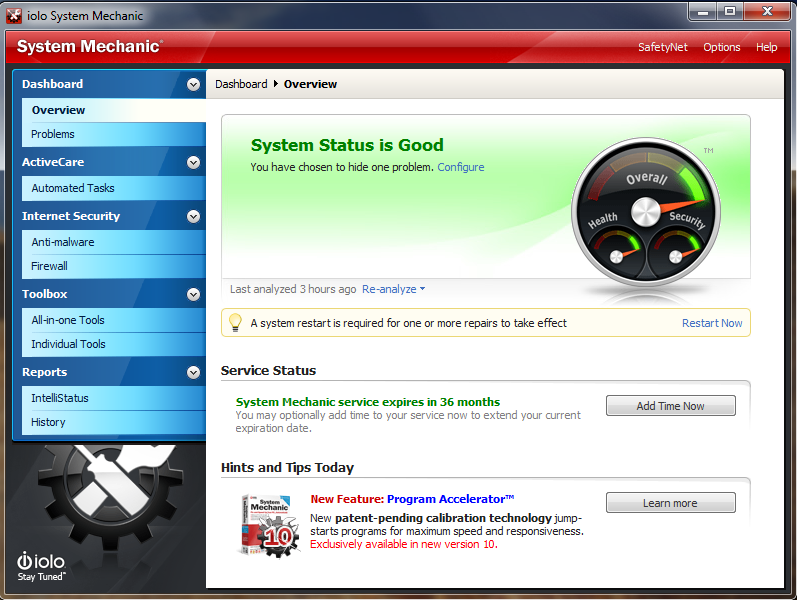 If you’re an average user, disappointed with your computer’s performance, or you’re just tired of having to deal with reoccurring unexplained issues, you’ll find that System Mechanic is worth every penny of its $39.95 purchase price. 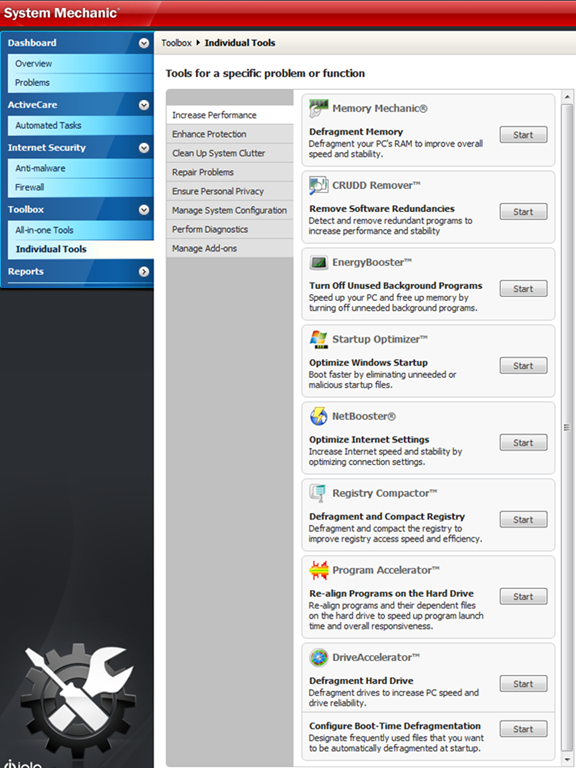 BTW, a single product license allows installation of the application on all of your personal PCs. Since many of us now have more than one computer, hopefully, more software vendors will follow Iolo’s innovative pricing structure.